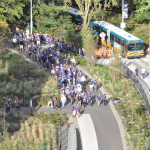 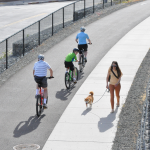 The award winning renovation of the Montlake Triangle and Lower Rainier Vista creates a seamless, grade-separated, multimodal transportation hub while improving the main gateway to the UW and completing the Olmstead Brothers’ historic vision for the campus. 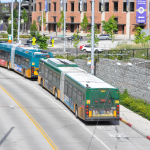 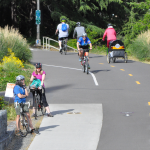 Working with several agencies such as SDOT, Sound Transit, WSDOT, multiple departments at the UW, and others, this highly complex project is made to look easy and simple. 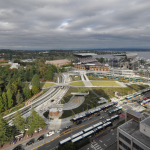 For instance, the Montlake Triangle houses an underground garage with limited structural capability, so the project included structural improvements, geofoam, and light weight soil – potentially the largest earthwork project over a building. 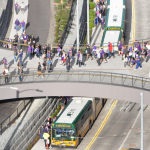 The bridge across Pacific Place is one of the first and longest 3-D post tensioned concrete bridges in Washington with clearance for buses below. 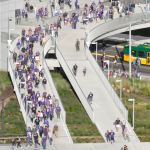 Funding for the $42.5M project was provided by the State, Sound Transit and the UW.